Having a party for friends and family is all about catching up with loved ones. But, if you are donning the event planner hat, you have a huge responsibility on you. The success or failure of the party will lie on your broad shoulders. If this is already working up your stress levels, fret not, Holland Party Hire is here to help! The foremost decision is finalising the venue. Outdoor events are in huge demand these days. A marquee is the perfect way of having an outdoor party laid out. Marquees safeguard against unpredictable weather conditions, besides adding character and charm to the event. Read on to know how you can ensure your garden is ready for your next marquee party. Begin planning your outdoor party 2-3 weeks before the actual day.This will give you sufficient time to make arrangements and save on last minute expenses. Hire a gardener few weeks before your event so that the surface is levelled and trimmed.The gardener will mow the garden to give it a professional look. It is advised to have the lawn mowed at least 3-4 days before the event. This ensures all the cut grass is properly collected by the mower and does not end up on the marquee walls instead. You can ask the gardener to plant a few flowers to match the colour theme of your event. If you are a pet owner, ensure the pet mess (aka faeces) is cleared off the lawn. Trust us, even the best of pet lovers hate stepping in the mess of your beloved pet, when they are dressed in their finest dresses and suits! Act smartly and outsource! 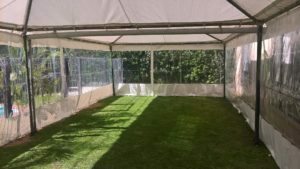 Hire a company to put in the marquee for your outdoor party. Marquee companies have gone from mere structure installations to offering lighting, seating arrangement, tableware solutions as well. Research well, check the reviews online and choose your marquee company wisely. This will go a long way in taking the burden off you! Decide on the style and theme of your outdoor party to finalise the type of marquee that is best suited for it. Factors like venue surface can affect the marquee choice. Marquees are now available in many colours and frames. Frame marquees are better suited for hard-standing surfaces like courtyards. For softer surfaces, traditional marquees work well. Marquees with doors and windows are better for uncertain weather conditions. On the other hand, open marquees bring out the event layout on a clear day. Marquees with opaque covers allow for visual displays within the tent. Marquees can also be customised to include a key feature in your garden like a fountain. Have the company do a site visit few days before the event and note the dimensions accurately. See to it that access points are known to the company. Most companies advise having a clear access to the garden / event venue for easily carrying their heavy equipment while installing the marquee. Does the marquee need to accommodate the dance floor, a separate lounge, bar area or a stage? How is the security arrangement planned? Is there parking provision at the venue?